In a study released in July 2010, the United States Department of Housing and Urban Development reported the median age of American homes as being 36 years. In other words, around half of our homes were built prior to the mid 1970's. Many items common today, such as microwaves, home computers and other electronics including large screen televisions, were not available at the time many homes were constructed. Unless your home's electrical service has been upgraded, your electrical system may be overburdened. Many homes built prior to the 1990's, do not have an electrical panel which can safely handle the home's current electrical needs. If your electrical system blows a fuse or a circuit breaker trips, do not simply replace the fuse or reset the breaker. When these conditions occur, consider it a warning that your electrical circuit is overloaded or another serious condition may exist. Circuit Breakers are designed to "trip" or shut down to prevent overheating and a potential fire. A panel commonly used from the mid-1950's up to the 1980's, is Federal Pacific Stablok, which may not provide adequate overcurrent protection. While these panels may work fine for years, after experiencing even one short circuit or overcurrent, these panels may lose their ability to provide future protection to your home and family. The materials used years ago to construct the breakers used inside these panels do not comply with today's safety standards. 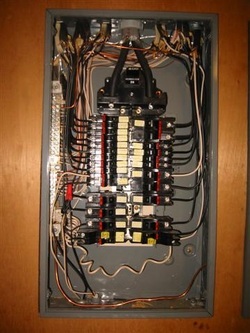 A home's circuit breaker panel is one of the most important parts of a home's electrical system. The electrical panel is responsible for receiving electricity from an outside source and then distributing it safely throughout your home. When functioning properly, this panel protects your home and your family's lives. The normal life expectancy of any electrical panel is 25-30 years. CWC Electric, LLC recommends any Federal Pacific Stablok Panel be replaced immediately. If your electrical panel is over 20 years of age, we recommend it be evaluated to ensure it is still working properly and continuing to protect your family, home or business. Call 785-215-8775 today for a free estimate on upgrading your electrical panel.